52 Landscape Architect and Specifier News 2016 Specifier's Guide park & recreation Fitness Trails / Exercise Stations Play Structures / Climbing Nets Greenfields Outdoor Fitness See Ad on page 61 Information Request # 9370 Endorsed by U.S. Paralympian Jennifer French, Greenfields' Signature Accessible exercise equipment allows those with mobility impairments to enjoy outdoor fitness zones alongside the rest of the community. 888-315-9037 greenfieldsfitness.com Park & Sports Information Request # 9560 PARK & SPORTS INC. designs and manufactures city furniture and playground equipment. We offer high quality products and services all over the world, and manufacture products that can be used in many outdoor areas and playgrounds. 281-208-7342 parkandsports.com See Ads on pages 55, 91 Information Request # 9090 Little Tikes Commercial 800-325-8828 LittleTikesCommerical.com With bold designs and new ways to play, our innovative play events and components are sure to electrify any play space. 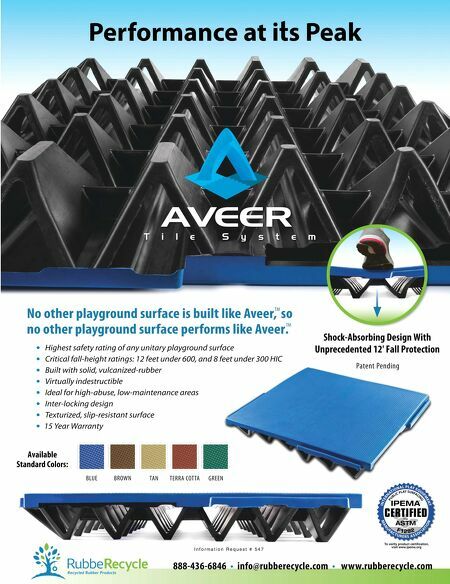 Products like our new NU-Edge X and HyPar Net are those eye- catching statement pieces that invigorate your playground. See Ad on page 59 Information Request # 9286 Berliner Seilfabrik Play Equipment 877-837-3676 berliner-playequipment.com Berliner creates and builds exciting themed playgrounds, such as the "Berlin.06" whale design. Play value, safe, enticing and accessible designs, plus high-quality ropes, stainless steel and unique custom combinations are at the forefront. Right: The Berliner Towradgi Ship and Tower 2. World Premiere Play Elements See Ads on pages 49, 90 Information Request # 9017 Miracle Recreation 888-458-2752 Miracle-Recreation.com Miracle broadens the horizons of play for every child with their high-powered new products. 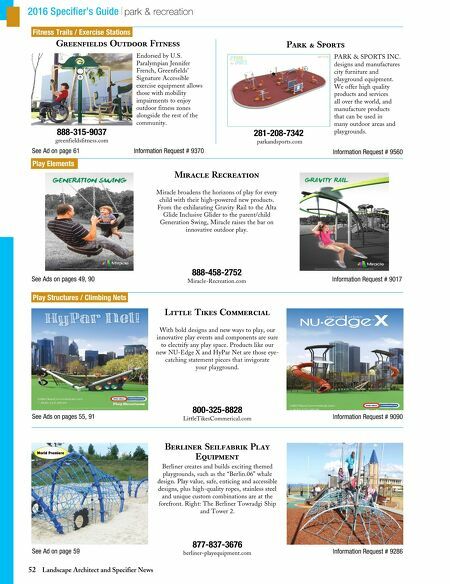 From the exhilarating Gravity Rail to the Alta Glide Inclusive Glider to the parent/child Generation Swing, Miracle raises the bar on innovative outdoor play.